Aegis sheet or pack to pack watermark equipment from THERM-O-TYPE. A1 6.5 batches per quart $28.73/qt. B1 29 batches per quart $69.87/qt. C1 5 batches per quart $54.68/qt. D1 9.4 batches per quart $60.83/qt. Each standard batch makes 454 cc of watermark chemistry. Each 454 cc batch can produce between 15M and 20M impressions. Chemistry D-1 has a limited shelf life of approximately 3 to 6 months stored in 60 to 80 degrees F.
(nolox towers on web presses). A1 6.5 batches per quart $34.48/qt. / 6 qt. min. B1 29 batches per quart $83.80/qt. / 2 qt. min. C1 5 batches per quart $65.62/qt. / 6 qt. min. D1 9.4 batches per quart $73.00/qt. / 3 qt. min. 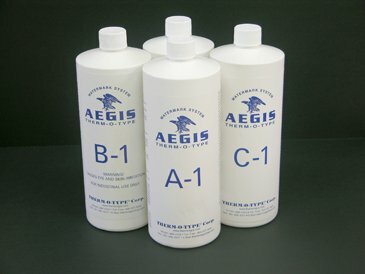 THERM-O-TYPE does not recommend using Aegis chemistry on any machine other than equipment produced by THERM-O-TYPE to apply Aegis Watermarks. non-THERM-O-TYPE watermark equipment do so at their own risk. THERM-O-TYPE will not be held liable for any loss of income or damage to equipment caused by customers using watermark chemistry on non-THERM-O-TYPE equipment. There is a strict, no return policy on all watermark chemistry sold to customers who are not using the chemistry in THERM-O-TYPE built Aegis equipment. By placing an order for Aegis chemistry, you are accepting the above listed terms and conditions. All Prices Quoted are US Dollars. THERM-O-TYPE Aegis Watermark Chemistry is used to apply custom watermarks to paper. Ideal for small quantity application, Aegis chemically applied watermarks are a “true” watermark, that is visible when backlit.